As far as we're concerned, there's no better way to say "I love you" than well, saying "I love you." 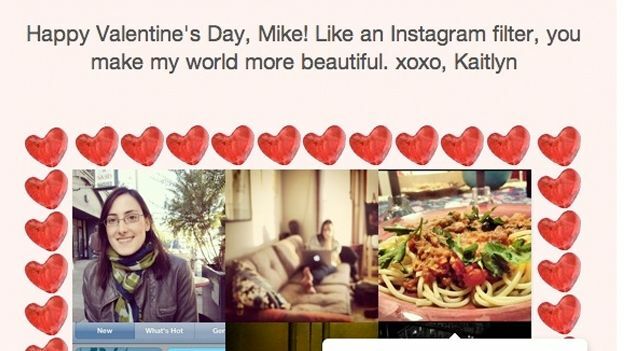 Failing that, you could use the new Lovestagram app which comes from the girlfriend of Instagram's co-founder. Lovestagram for iPhone allows you to add romantic frames to your Instragram photos to create a slideshow of your relationship. Each can be accompanied by a message or a memory or whatever you feel like writing. If you sign-in to your Instagram account and then add the name of your significant other, providing they use the service too, all of the shared photos that have been tagged, photos you have shot in the same location within the same hour and all of your exchanged comments will come together to create one applicious Valentine's Day gift. The app was created using the Instagram API by Kaitlyn Trigger, who's the long-time sweetheart of Instagram founder Krieger. The talented better-half taught herself all of the relevant code and produced the app without Krieger's knowledge. Instagram has been a huge success on the iPhone with its massive array of retro-style filters. An Android app has been promised for later this year.